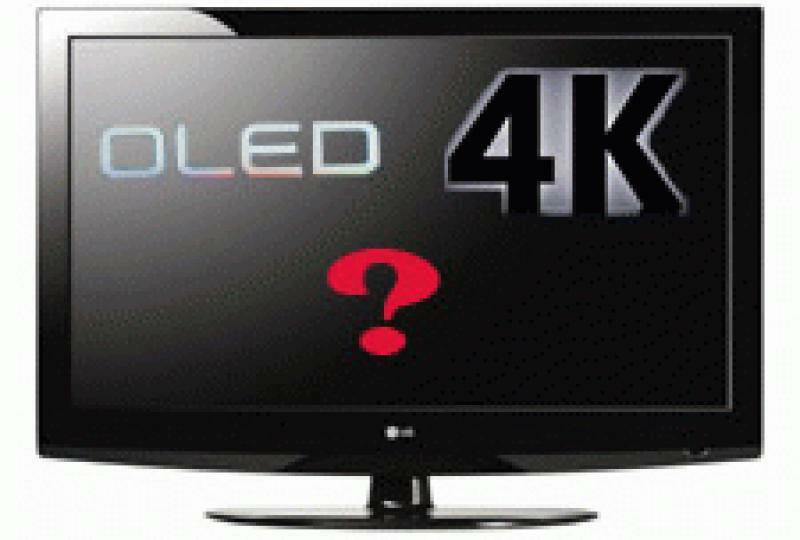 What Technology Will Save HDTV: OLED or 4K And At What Price? During a post-CES conversation over on the HomeTheaterEquipment.com forum, some people were speculating on what the price point might be for the new 55-inch OLED TVs from LG and Samsung. One commenter said that LG has hinted that the initial price may not be as high as you might expect. To which I ask, "Is that a good thing?" • See more in our Feature News Stories section. • Learn more about the new wave of 4K technology. Purely from a consumer perspective, a lower-than-expected price point is certainly good, because it means you might actually be able to afford the TV when it first hits the market. However, from an industry perspective, I think the worst thing that LG or Samsung could do is price this new technology too low from the get-go. As I reported a few weeks ago ("Is a Narrower Focus the Key to Survival for Some TV Manufacturers? "), times are tough for TV manufacturers right now. A lot of big names (like Hitachi and Mitsubishi) have abandoned flat-panel TV production, and stalwarts like Sony and Panasonic are facing big losses. Even for top sellers like Samsung and LG, big sales don't necessarily translate into big profits. Here's one example: in the aforementioned news piece, I discussed how Sharp's focus on larger screens might be paying off, as the company has exceeded its North American sales forecast and now holds 80 percent of the U.S. market in screen sizes over 60 inches. Then, on February 1st, Reuters reported that Sharp is forecasting a record $3.8 billion net loss for the year to March. The story goes on to state, "Sharp had been expected to fare better than its bigger Japanese rivals Sony Corp and Panasonic Corp ... by focusing on premium big-screen TVs that have proved popular in the U.S. market. But the company said its Sakai LCD plant would halve output for the January-March quarter, with the reduction likely to remain in place for the first half of the next financial year." It seems like, across the industry, every positive sales report is met with an equally negative earnings report, and that's not a healthy sign. The fact is that the current crop of flat-panel HDTVs has become a commodity. Yes, you'll still see a respectably wide range of prices within the TV market, based on features and levels of performance; however, there's no true "high end" in the TV market, at least not compared with other home theater categories. People simply aren't willing to spend exorbitant amounts of money on an LCD or plasma TV when they know that they can get very good performance at a lower price. Remember when the flat-panel TV first arrived on the market? It was new, it was exciting, and it was extremely expensive. Most of us could not afford it, but we sure wished we could, especially when HD was added to the equation. It was easy even for the general consumer to see what these new technologies brought to the table, and we wanted it. We aspired to own it some day, and half of the fun was watching the price trickle down every year, wondering when it would reach that magic point where we could actually afford it. Then it did reach that point, the buying frenzy began, the TV manufacturers started cranking out new factories and ramping up production, and companies like Vizio came along with good-performing TVs at much lower price points. And so we saw the race to the bottom, price-wise. Don't get me wrong, I'm not complaining that you can buy a good HDTV for a very reasonable price these days. The problem is, nothing new has emerged to fill the void at the top of the market (3D sure wasn't it). If you look across the different home theater categories -- from speakers to electronics to projectors, heck, even to cables -- a huge price spectrum exists within each category. In the TV realm, the top spectrum is no longer represented. We need something to crave. The two big TV-related stories at this year's CES were OLED and 4K. Do either of these technologies have the wow factor -- should I call it "the crave quotient" -- to position themselves at the top of the market? I'm not convinced that 4K can capture the imagination of the videophile and general consumer alike, the way flat panels and HD did years ago. Sure, in a direct side-by-side comparison with a 1080p TV, you can see the extra detail, but 4K is best appreciated in the projection realm on much larger screens. The one exception is with passive 3D technology, where the extra resolution addresses the primary drawback to passive 3D: namely that you only get half the vertical resolution to each eye. With a 4K display like the 84-inch 84LM9600 that LG had on display, you get a full 1080-line signal to each eye, which makes passive 3D look a whole lot better. Still, is that one benefit enough to make people empty their wallets? I doubt it. OLED, on the other hand, shows promise. Combine the super-thin, cool form factor with very high-performance potential and you've got a product that can appeal to both the enthusiast and the everyday shopper. If the crowds I saw and the comments I heard at the Samsung and LG CES booths are any indication, then people are excited about OLED ... excited enough to expect a high price point. If LG and Samsung set the bar too low right out of the gate, they might get a few more initial sales but could miss out on a good opportunity to foster excitement, long-term growth, and maybe even some profit in a new high-end category. Admittedly, the re-creation of clear budget, mid-level, and high-end genres won't solve all of the TV industry's woes, but perhaps it could create a little balance and stability in an industry that desperately needs just that.